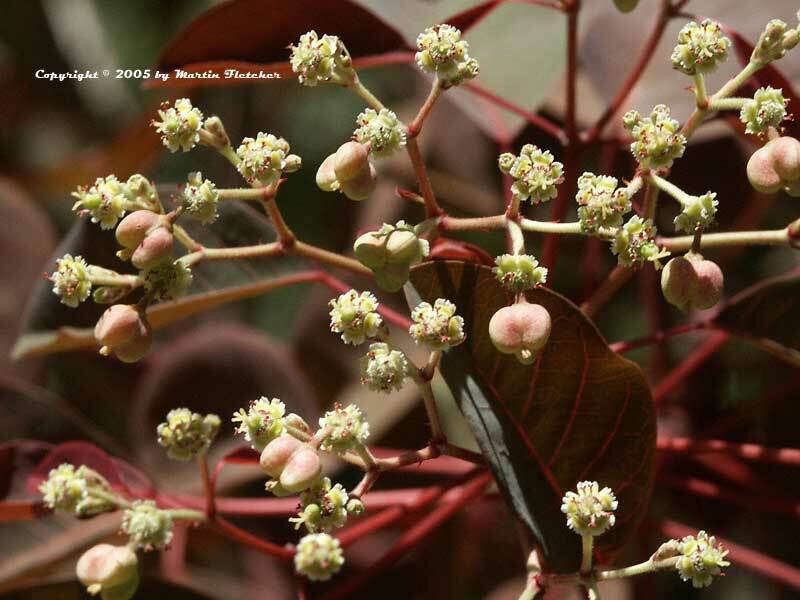 Euphorbia cotinifolia has red leaves the color of the smoke bush, cotinus coggygria. The Caribbean Copper Plant will quickly grow to 10-15 feet. Euphorbia cotinifolia is rather frost tender. The Caribbean Copper Plant will lose all of its leaves if there is anything even close to a frost. The Caribbean Copper Plants will live through cold snaps that dip into the mid-20°s F but the smaller branches will likely melt away. Euphorbia cotinifolia will perform best if there is regular garden water. While they are quite drought tolerant they withstand this affront by dropping all of their leaves. The veins of the red leaves are beautiful when they are backlit. The creamy white flowers look very exotic with their red appendages and outsized seed pods. Even if used as a big annual Euphorbia cotinifolia grows easily enough and quickly enough to have an impact. White flowers contrasting with red foliage of Euphorbia cotinifolia - Caribbean Copper Plant. High resolution photos are part of our garden image collection.